Apple iPhone sales in China fell 20% year-on-year in the fourth quarter of 2018, while sales for smartphones made by home-grown rival Huawei soared by 23%, data from industry research firm IDC shows. The report is the first to put a firm number on the scale of a recent decline in Apple's fortunes in the world's second largest economy. It comes after Apple's chief executive Tim Cook pointed to China as a big factor in a rare cut in the company's quarterly sales forecast last month. The figures in the report showed a 19.9% fall in Apple's smartphone shipments in the final quarter of 2018, while Huawei's grew 23.3%. That reduced Apple's market share to 11.5% from 12.9% a year earlier, the report said. 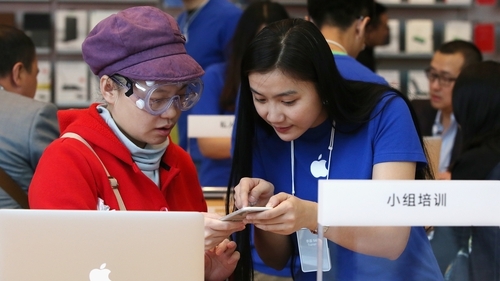 "The severe macro environment in China and the assault of domestic brands' innovative products have also been reasons for Apple's continued decline," it added. Counterpoint said iPhone sales in the fourth quarter, which includes India's electronics sales-heavy Diwali festival, fell 25% on the year, reducing total sales in 2018 to 1.7 million units from 3.2 million a year earlier.